ONTARIO, Calif. - The Ontario Reign, four-time ECHL Pacific Division Champions and proud ECHL affiliate of the NHL's 2014 Stanley Cup Champion Los Angeles Kings and Winnipeg Jets, have announced that goaltender Joe Cannata has been reassigned to the club from the Utica Comets of the AHL by the Vancouver Canucks. Cannata, 25, has appeared in 21 games with Ontario this season, sporting a 12-6-0-2 record along with a 2.02 goals-against average and .927 save percentage with one shutout. 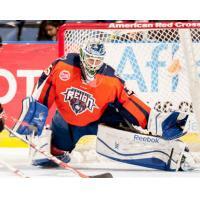 He was named the starting goalie in the ECHL All-Star game. In five games with the Comets this season, the Wakefield, Mass. native has posted a 3-2-0-0 record, with a 1.99 goals against average, and a .932 save percentage. A sixth-round selection (173rd overall) of the Canucks in the 2009 NHL?Entry Draft, Cannata played four years at Merrimack College from 2008-12, where he appeared in 122 career games posting an overall record of 59-46-16 with seven shutouts, a 2.47 goals-against average and a save percentage of .915. The Ontario Reign will open the 2015 Kelly Cup Playoffs with a first round matchup against the Colorado Eagles, with Game 1 scheduled for Thursday, Apr. 16 at 7 p.m. at Citizens Business Bank Arena. Playoff tickets are on sale now and start at just $12. Tickets can be purchased online at AXS.com, or by visiting the Citizens Business Bank Arena box office. Fans can also purchase discounted playoff ticket plans and gr oup tickets by calling the Reign front office at (909) 941-PUCK (7825). For more information, visit ontarioreign.com/tickets/playoff. Become a Reign Season Ticket Member today! Season tickets for the 2015-16 season - Ontario's first as a member of the American Hockey League and the primary developmental affiliate of the LA Kings - are on sale now. All Season Ticket Members also receive free parking, ticket exchange, account manager access, an invitation to an exclusive Season Ticket Member event, guaranteed giveaways (one per account) and more. Season ticket packages start as low as $340, and include payment options for your convenience. For more information on Reign season tickets - along with a comprehensive list of Season Ticket Member benefits - please call 909-941-PUCK (7825) to select and purchase your 2015-16 season seats today! Visit us at ontarioreign.com, follow the team @OntarioReign and visit ontarioreign.com/ahl for additional information. And be sure to listen to all home games and select road matches for free via Spreaker.